With SimDif you can - create - and maintain - your own professional website also from your Android device. Build your presentation site quickly and effectively. 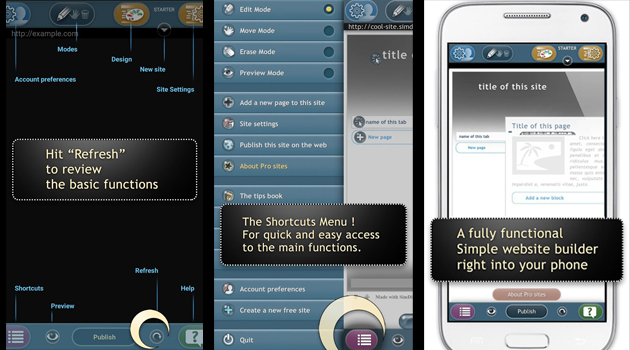 Website Builder is an innovative WYSIWIG-style web editing app by Simple Different Co Ltd. This free Android app simplifies the act of building a website on the go, innovating the web development experience even for users with no experience in development. 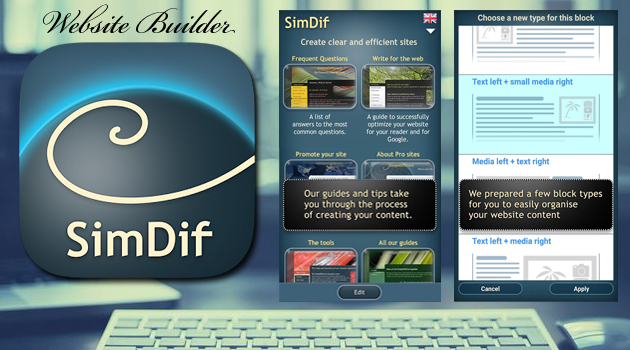 SimDif Website Builder focuses on the creative side of website building, rather than the technical side. It’s geared at the business professional or hobbyist who has a great idea to share with the world, but no technical know-how to make it happen. With this app, you can get started building a professional-looking website with no experience or additional tools at all. User experience is the number-one concern of this app, and it bends over backwards to create a great experience. The app features ad-free hosting and offers you a 7-page starter website at no cost. Effortlessly build galleries, contact forms, journal pages, and more. If you’re not sure about a certain feature, SimDiff offers customer support with a great focus on customer service, so you can be sure to get an answer quickly. The Website Builder app features a carefully-crafted user interface that focuses on accessibility regardless of your tech level. It’s WSYWIG-style, meaning that you can click, drop, and add elements with no need for code: what you see on your web page as you’re editing it is exactly how it will look when you’ve published it. This eliminates a lot of interface-related headaches, especially for new users. Another great feature of the Website Builder app’s interface is its seamless ability to switch between multiple devices to build, edit, and maintain your website. This is a great feature for users who have busy schedules and need to devote time both at home and at work to maintaining their websites. You can save your website progress on your Android tablet and open it up at exactly the same place on your PC later. Website Builder by SimDiff is a great quality app for low-experience users who need some hand-holding through the web development process. We highly recommend this app both for personal and business use.